The PJD6211 is an advanced 120Hz / 3D ready DLP projector which includes Brilliant Color technology to produce more vibrant colors, while the high brightness and contrast ratios make this projector shine in virtually any lighting situation. This projector is designed for table‐top use or can be mounted on the ceiling for classrooms and meeting rooms. The top load lamp and filter‐less design provides for easy maintenance and low total cost of ownership. The extensive input options and integrated 2W speaker provide for effective presentations or classroom lessons. This projector also features closed captioning for the hearing impaired. The PJD6211 is ideal for use in both classrooms and corporate settings. Built with Brilliant Color TM technology, The PJD6211 delivers 2300 lumens with a 1024 x 768 XGA native resolution. It is future proofed for the latest technologies with 120Hz / 3D ready support and offers a variety of features such as control and closed captioning for the hearing impaired. The PJD6211 offers both Kensington security lock port and security bar for increased theft deterrence. There are 8 default picture modes (Dynamic, Cinema, Normal, Whiteboard, Blackboard and Greenboard) depending on the user application. The first--and most important--item you'll need is a 3D-ready display--whether it be a 3D HDTV, 3D projector, or 3D computer monitor. These displays usually have a higher processing power than older models as they need to display one image for each eye to create a 3D effect. While your display is ready for 3D playback, you still need a device to read 3D content (i.e., a movie or a show). This source can be a cable box with a subscription to a 3D channel, a 3D Blu-ray Disc player, or a PlayStation 3. In order to watch 3D, you will need to get some 3D content. This 3D content will come from the source mentioned above in the form of a 3D program, movie, or game. Please ensure that your 3D movies are in the Blu-ray 3D format, as this new format will provide the best 3D experience. All 3D HDTVs on the market require Active Shutter glasses to create the 3D effect. You will need to buy one pair of glasses for each viewer. Also make sure that the Active Shutter glasses you buy are compatible with your display--for example, buy the glasses from the same brand as your 3D HDTV. To connect your source (such as a 3D Blu-ray Disc player) to your display, you'll need a hgh-speed HDMI cable. Cables with this designation--with bandwidth speeds up to 10.2 Gbps (gigabits per second)--will be able to carry the 3D signal without any loss of quality. If you want to get more information about 3D, shop our 3D products, watch videos, or interact with other customers, visit 3D 101, our customer center about everything 3D. 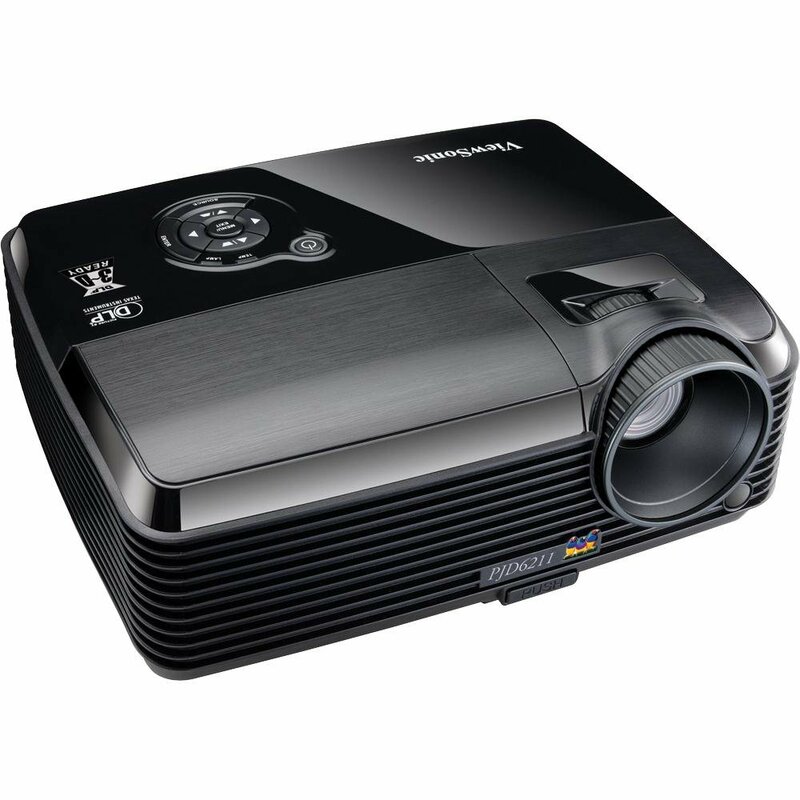 ViewSonic’s PJD6211 DLP® projector is ideal for use in the office or onthe road. It delivers amazingly clear images with the digital clarity of DLP’s BrilliantColor™ technology. This budget-friendly projector boasts amazingly fast 120Hz frame rate and is 3D-ready for graphic renderings in the office or 3D games or movies at home. With high contrast ratio and brightness and ViewMatch™ technology to adjust color perfectly, your presentations will be rich, vibrant regardless of the setting. This projector is a lightweight powerhouse that offers multiple inputs, including support for 720p and 1080i HDTV signals. Eco-mode extends lamp life and reduces fan noise. Enjoy easy set up with auto source detection and auto sync. When you’re done, just unplug it and go. The PJD6211 DLP® projector delivers excellent performance and value for small business and home entertainment applications. Using less watts per lumen than other comparable projectors. And with a 2000:1 dynamic contrast ratio, it's the bright choice for business, education, mobile and home presenters. Business - conference rooms, meetings, brainstorming, etc. Color is one of the most important characteristics of a good projection system, and the latest BrilliantColor technology delivers stunning all-digital clarity with lifelike color, sharp graphics and outstanding video. The sophisticated 6-segment color wheel enhances the yellow color performance that is key to accurate and vivid color reproduction. With multi-color processing, colors are richer and more vibrant with exquisite and precise detail. With support for TI's DLP Link technology, you'll have amazing 3D capabilities at your disposal. The projector's embedded emitter function means all that's required to unlock 3D capabilities is a pair of DLP Link compatible glasses, such as the optional ViewSonic PGD-150 active shutter glass kit. FuHzion 120Hz/3D-ready techology provides the most immersive viewing exerience possible. Whether you are a gaming enthusiast fighting alien creatures, exploring new worlds in your favorite 3D movies, or a student learning anatomy, science or geography in the most efficient way possible, ViewSonic's 3D projection technologies offer unlimited possibilities. ViewSonic 3D-ready projectors support the two leading 3D technologies from Texas Instruments® (DLP Link) and nVidia (3D Vision). With only a slight 20% decrease in brightness, the ECO-mode function can extend the life of your lamp by almost 50% and up to 6,000 hours in some cases. Other benefits of ECO-mode operation include reduced power consumption, as well as less heat and audible noise output. It's good for the environment and great for your budget. The ECO-mode function will definitely help lower your total cost of ownership (TCO). Choose a projector that fits your space, as well as your lifestyle and needs. Simply determine your desired image size and then cross reference on this chart to locate the required projection distance. An interactive distance calculator specific to each and every ViewSonic projector is also available here to help calculate desired image size and throw distance based on your screen size. DLP/LCD technology statement Instead of having glass panels (LCD) through which light is passed, the DLP chip's surface is made up of thousands of tiny mirrors each representing a single pixel.